What is a compost newbie to do with their first batch of compost? How can I use it in my spring garden? • Use as a mulch around fruit trees, shrubs and perennials. 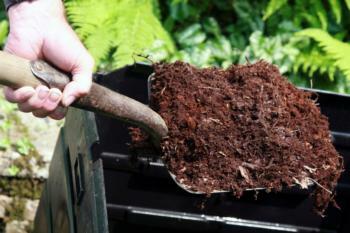 Place compost 6 to 12 inches from the base of the tree trunks and out to the drip line. This provides two weed-fighting benefits: The compost blankets existing weeds and smothers them, and it will also prevent sunlight from reaching the soil, preventing germination of weed seeds. Weeds are a real challenge around fruit trees because they will compete with the plant for water and nutrients. They can be difficult to remove around a tree’s roots. Weeds can also harbor pests and some weed species host pathogens that promote crown diseases. In addition to the “big three” nutrients (nitrogen, phosphorus and potassium), homemade compost typically contains small quantities of micronutrients, and releases them into the surrounding soil over time. If you suspect that a fruit tree has a nutritional deficiency, try adding compost at regular intervals to the soil around it to complement your routine fertilizer regimen. You can surround the bases of smaller ornamental plants (such as shrubs, roses, and perennials) with compost to provide the same weed-deterring and nutrient-boosting benefits. • Amend and top dress your vegetable beds. For new beds, pile on the compost and dig it in prior to seeding or planting vegetable starts. In doing so, you will replenish the organic matter that got depleted by last season’s crops, and just as important as feeding the vegetables you’re growing, you’ll be feeding the beneficial microorganisms in the soil. In turn, some of those microorganisms will prey on soil pathogens. Many types of compost help control parasitic nematodes by increasing the nutrient composition of the soil and providing an ideal breeding ground for beneficial, nematode-destroying fungi. A benefit of amending with compost that is more obvious to the naked eye is the improvement in the physical properties of garden soil. The organic matter in compost binds together the soil particles in the clay soils which are characteristic of Marin gardens, improving aeration, water infiltration, and root penetration. Throughout the growing season, add compost to your vegetable bed’s soil surface as a top dressing, taking care not to smother the crown areas of individual plants. If you plant in rows, lay down bands of compost between your rows of crops. Eventually these layers of top dressing will “melt” into the soil, and unlike fine woody mulches, won’t deplete the soil of nitrogen as they decompose. It can be tough to manage a container-grown plant’s water needs. Since potted plants have access to only a limited amount of soil that they can draw moisture from, they are more susceptible to drying out than landscape-grown ones. Compost can provide a welcome buffer between the surface of the soil in the container and the wind and summer sunlight that would dry it out. Compost reduces that hard to break, crusted up soil surface that can result when you miss a day of watering. When planting new containers, dig a few scoops of compost in with the potting soil.